Cadence Living has hired Dale Schall as its vice president of culinary experience. In his new role, Schall will focus on the opening of Cadence’s Inspira Arrowhead and Acoya Mesa communities in Arizona. Schall has over 30 years of experience in food service, management and kitchen design. Most recently, he worked as a general manager at Sodexo Corporate Services, a role that tasked him with overseeing food service programs for multiple corporate campuses. Schall also worked as the executive chef at Sierra Pointe, an Arizona retirement community. Atlas Senior Living has promoted Abbey Reach, a former executive director with the company, to work as its new director of compliance. Reach is now tasked with providing regulatory and compliance support for all of Atlas’ communities, clinical oversight, incident reporting and care planning compliance, mock surveys and action plans, corporate compliance and risk management and community HR benefits reviews and rollouts. Reach first began working with Atlas Senior Living in 2016, when the company promoted her to the executive director role after acquiring the Sunrise Ridge Assisted Living community in Trussville, Alabama. Reach first joined Sunrise Ridge in 2008 as a business office director. Brian Geyser has assumed the role of Chief Clinical Officer for Maplewood Senior Living’s new Inspir properties. In his new role, he will help lead the development of the Inspir health, wellness and clinical care delivery model. He’ll also seek out strategic partnerships with health systems and clinical providers in Maplewood’s urban markets and oversee all the brand’s clinical operations and care delivery. Geyser shared the news in a LinkedIn update this week. He previously worked as the company’s vice president of clinical innovation and population health. Greystone Healthcare Management has appointed Stephanie Handelson as its new CEO. Handelson succeeds Gerry Jenich, who served as interim CEO since February, 2018. Greystone Healthcare Management is headquartered in Tampa, Florida, and manages 28 skilled nursing and assisted living communities, outpatient rehabilitation, home health and private duty agencies. Prior to joining the company, Handelson worked as president and COO of Benchmark Senior Living for eight years. Handelson is also a former member of the National Investment Center for the Seniors Housing & Care Industry (NIC) Operator Advisory Board. She also spent three terms on Argentum’s board, and is a member of the American Seniors Housing Association (ASHA) and Senior Living 100 advisory board. K4Connect has announced the appointment of Keith Stewart as its chief growth officer. In his new role as chief growth officer, Stewart will apply two decades of experience in the technology industry. Before joining the company, K4Connect, Stewart was the chief revenue officer for Site 1001, a California-based startup centered on smart buildings, real estate technology and construction technology. The company also expanded the duties of president Derek Holt to include those of a traditional COO. Holt will now help oversee internal and field operations, marketing and communications, program management, customer success, and product marketing. Plante Moran has hired Cindi Raymond as a principal in its healthcare strategy and operations practice. In her new role, Raymond will serve national clients and help guide them through the changing U.S. health care landscape. She will specifically focus on process and operational improvement, PDPM readiness and strategic business planning. Raymond was previously vice president of clinical operations and chief nursing officer at Trinity Health Senior communities. Harbor’s Edge, a continuing care retirement community (CCRC) in Norfolk, Virginia, has made Steve Minter its new COO. Minter, a 30-year veteran in the senior housing industry, will oversee all of the community’s internal operations, including resident and community life. Minter joined Harbor’s Edge after two years as a general manager with Seniorcorp. He also previously worked for 18 years with Sentara Healthcare, where he was the director of operations in the senior services division. MBK Senior Living has named Shane Ness, Judith Jones and Robyn Childs as its newest regional directors of sales. The new appointments will help MBK support its sales and marketing teams at its 33 communities in the Western U.S.
All three have experience in the senior living industry. Ness most recently served as the director of sales and marketing for the company’s Tuscany at McCormick Ranch community in Scottsdale, Arizona. Jones, meanwhile, has worked to support communities in California, Arizona, Utah, Texas, Kansas, Illinois, and Connecticut. Childs similarly has extensive marketing and sales experience in the senior living industry, and has worked with over 100 communities and teams across the country. Oak Crest, an Erickson Living CCRC in Parkville, Maryland, has announced the promotion of Amy Ward to assistant HR director and the appointment of William Tian as associate executive director. Tian in his new role will support the community’s day-to-day operations, while Ward will assist with human resources duties. Ward has worked with Oak Crest since 2016 as a senior human resources manager. Tian previously worked for Genesis Healthcare, where he was a division vice president of dining and allied clinical services. Balfour Senior Living has promoted Olivia Carranza to the role of administrator of Lavender Farms, a new expansion set to open at its Louisville, Colorado, campus. In her new role at Lavender Farms, Carranza will work the community’s executive director to help manage and lead the community. Carranza has worked for Balfour for 14 years, making her one of the company’s longest-tenured employees. She first joined Balfour in 2004 as a nursing assistant and has worked as a health information manager for the last five years. 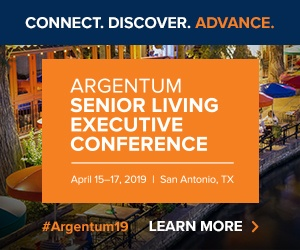 Integral Senior Living (ISL) has hired E. Taveirne as the executive director of Travanse Living at Wheaton, a community in Wheaton, Illinois. In his new role, Taveirne will oversee the community’s day-to-day operations and team management, hire department heads and care staff, and coordinate with ISL. Friendship Senior Options has filled three management positions at its GreenFields of Geneva and Friendship Village of Schaumburg communities in Geneva and Schaumburg, Illinois. The company named Tony Madl as Geneva’s new executive director, Casey Pudwill as the new administrator of Briarwood Healthcare of Friendship Village, and Tony Rizzato as the new administrator of Briarwood Healthcare of GreenFields. Buckner Senior Living named Eric Feinman as the health services administrator for its Ventana by Buckner community in Dallas. Feinman has in the nursing home administration field since 1991. He’s a licensed nursing facility administrator and certified assisted living administrator in Texas. Ventana by Buckner is set to open later this year. Charter Senior Living has named Kasey Moore to work as director of sales and marketing for Charter Senior Living of Panama City Beach, an independent living, assisted living and memory care community in Panama City Beach, Florida. Moore previously worked in admission and marketing for a health and rehabilitation center.